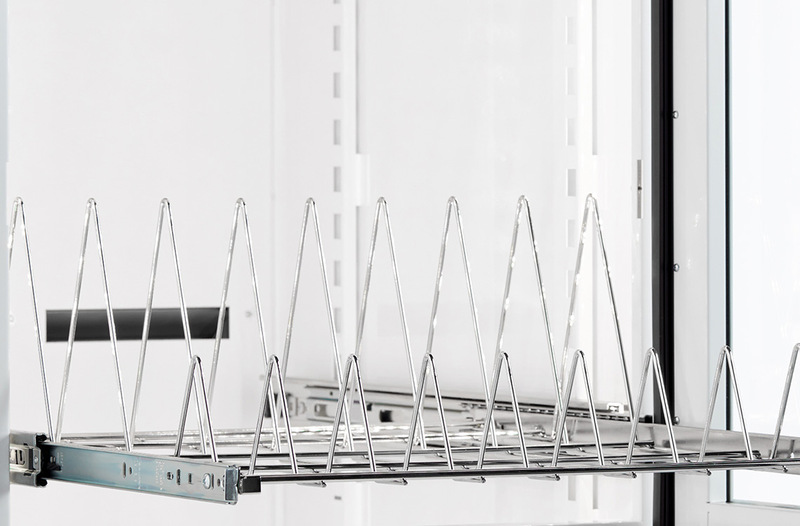 Fully network-capable with mobile connectivity and total accessibility from any networked device, ECD's SmartDRY™ Intelligent Dry Storage™ technology enables compatibility with smart factory, Industry 4.0 operations. 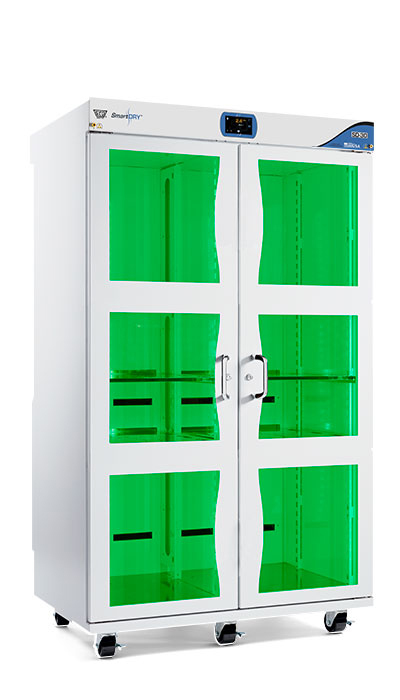 Market-leading recovery time of less than 3 minutes provides constant access to stored parts. 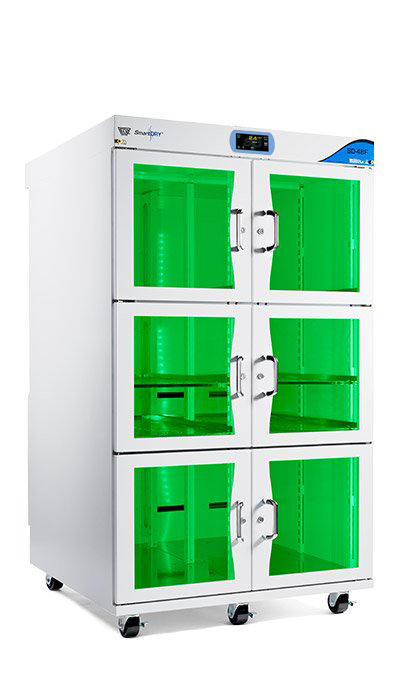 Exceptional, self-regulating drying technology allows assembly specialists to retrieve critical moisture-sensitive components from desiccant dry cabinet as many as 10 to 12 times per hour. That’s more than twice the access of competitive dry cabinets. Designed by trusted electronics innovator ECD and quality-built in the U.S.A. Integrated network tracks events from all SmartDRY™ cabinets for access to data on connected devices. Immediate visual confirmation of dry storage status means no more guessing about cabinet readiness. 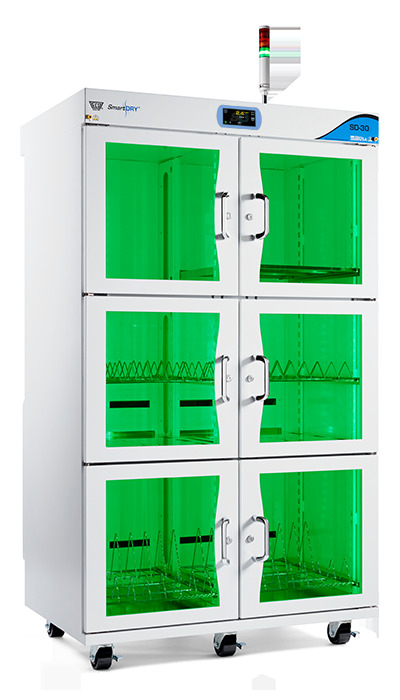 A simple glance at SmartDRY™ and its green, amber or red interior lighting tells operators if the unit can be accessed. It’s simple, effective and smart. An optional light tower can be integrated for visual status confirmation from across the factory floor. 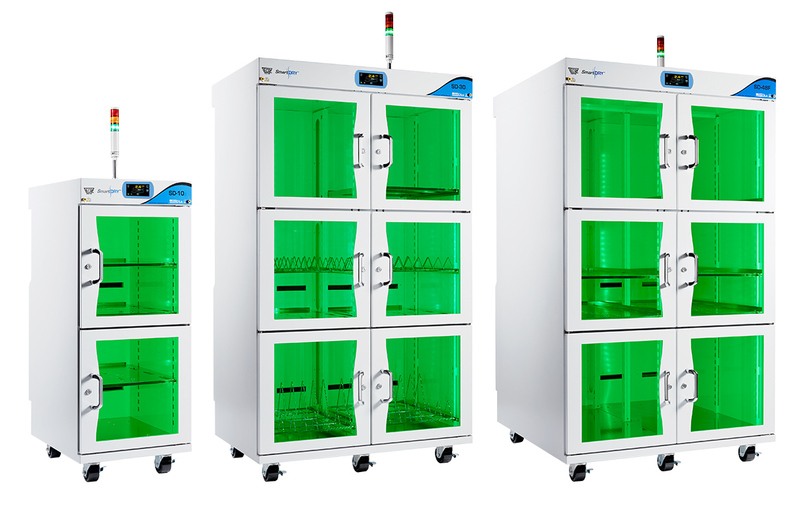 Eliminate time-consuming and complicated calculations for bake cycles. 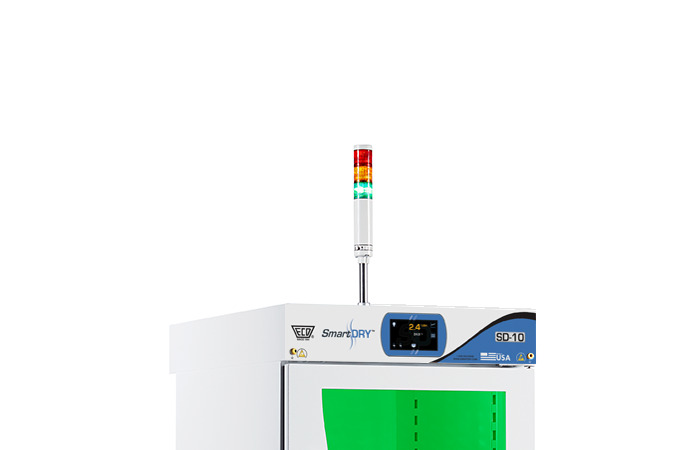 SmartDRY’s Intelligent SmartBAKE feature automatically establishes J-STD-033 compliant bake times based on a component’s MSL level, thickness and exposure time over floor life. 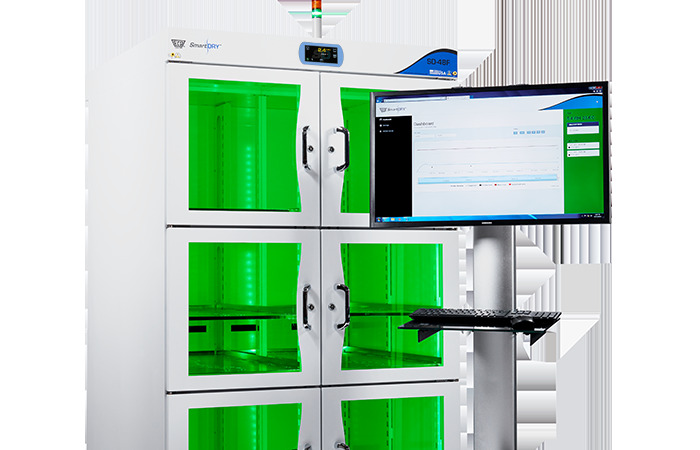 J-STD-033 Easily and automatically establish bake time and temperature (40°C), based on the J-STD MSL level and component size, making tables or calculations unnecessary. 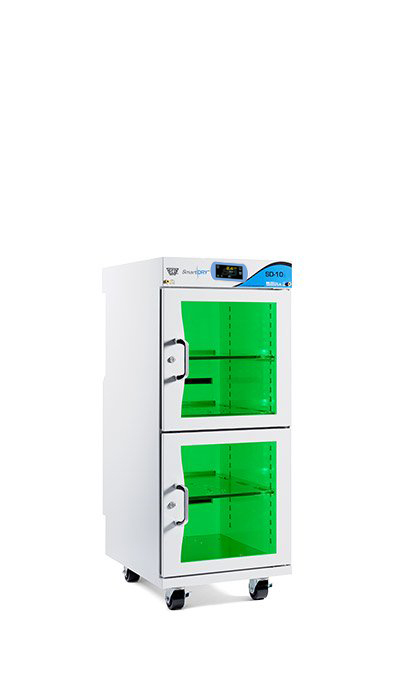 Manual Bake Manually adjust max temperature (60°C), humidity and time. 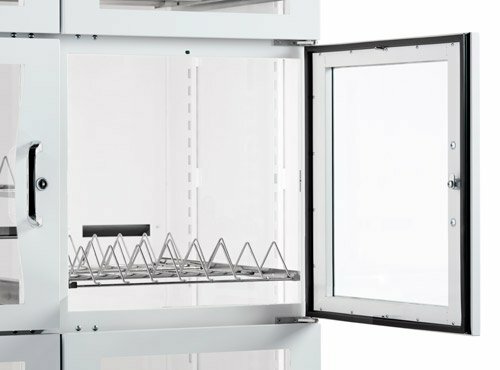 Unlike traditional standalone baking ovens the SD-10 with baking option is still a dry cabinet and will no re-expose your components to humidity once the bake cycle is over. Calibration User replaceable probe, 1 Year calibration interval recommended. ECD - ISO 17025 Accredited. Use SmartBAKE™ to easily and automatically establish bake time and temperature (40°C), based on the J-STD MSL level and component size, making tables or calculation unnecessary. Use Manual Bake mode to manually adjust max temperature (60°C), humidity and time. 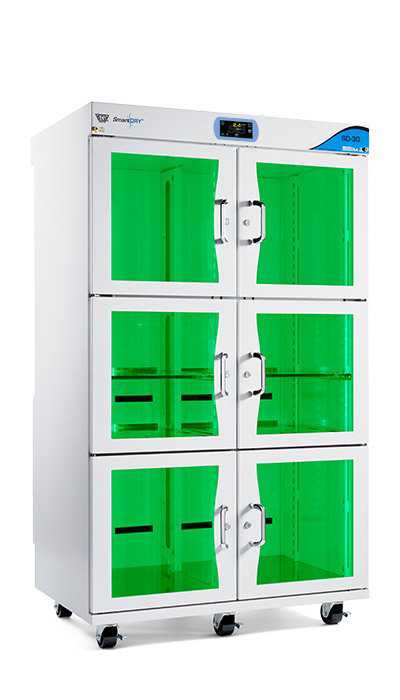 Unlike traditional standalone baking ovens the SD10 with baking option is still a dry cabinet and will not re-expose your components to humidity once the bake cycle is over. Other options available. Contact ECD Team. Data subject to change. At ECD, our customers’ perceptions are our reality. So, when customers talk, we listen….very closely….and take customer input to heart. In fact, that’s how some of our greatest products and enhancements have developed. 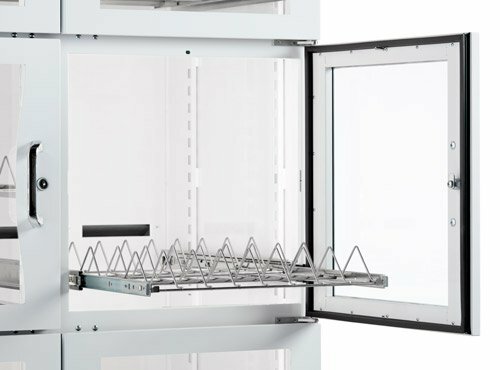 Pull-out shelves and Reel Racks, SmartBAKE, and more. 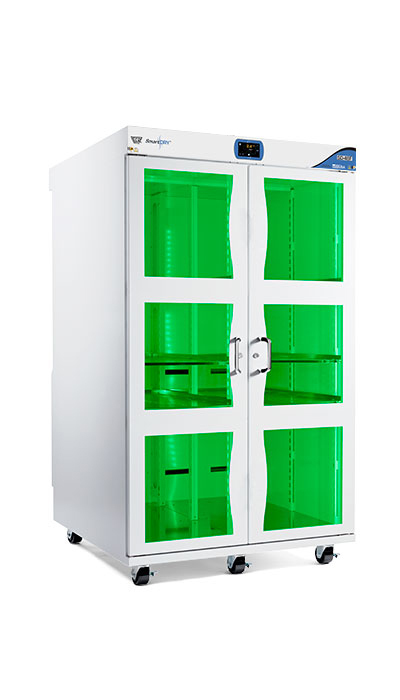 SmartDRY™ desiccant dry cabinet, for the storage of surface-mount technology (SMT) components with a Moisture Sensitive Level (MSL), intelligently maintains a low relative humidity (RH) as required by the IPC standard J-STD-033 while preventing electrostatic discharge (ESD) using durable electrically conductive powder paint surfaces over steel construction. SmartDRY adds sophistication and intelligence to the storage of moisture-sensitive parts. Fast recovery rates, immediate visual confirmation of status, and self-regulating regeneration make SmartDRY the most cost-effective, user-friendly, affordable and SMART dry storage system on the market. 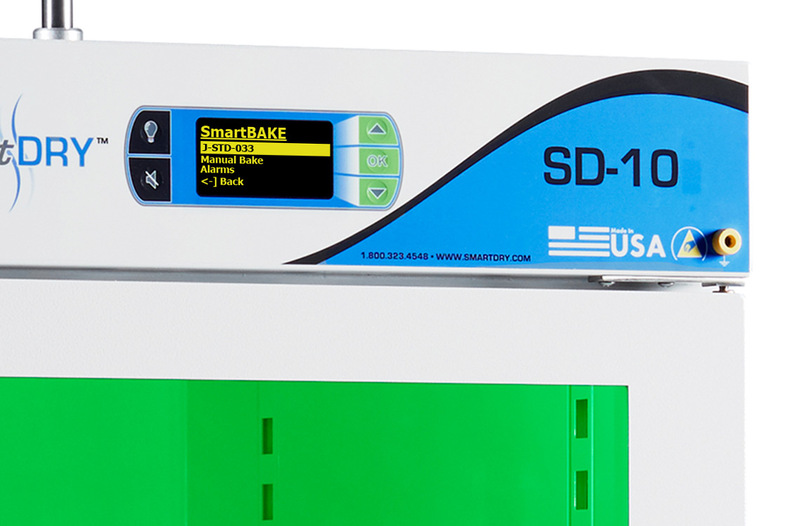 Even the SmartBAKE option (SD-10-only) has SMART and Manual modes of operation. 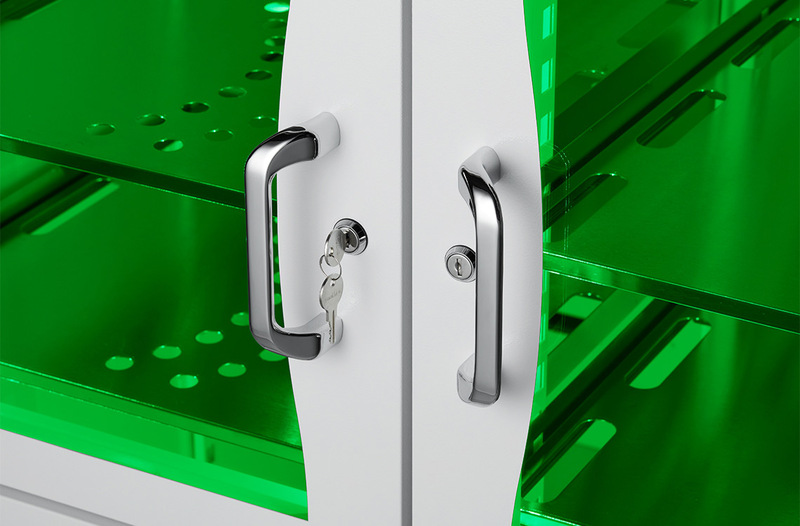 No guesswork, no hassle, no out-of-compliance components. How fast can SmartDRY™ recover? 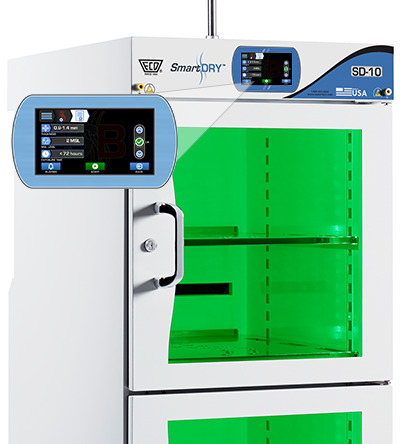 ECD SmartDRY™ SD-10 recovers in under 3 minutes. This greatly increases accessibility to your stored components. 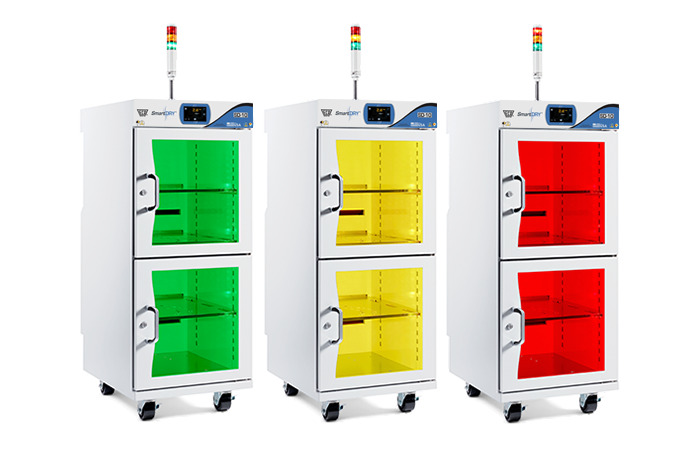 Manual Bake - Allows user to adjust temperature (30 to 60°C), humidity and time. Unlike traditional standalone baking ovens the SD10 with baking option is still a dry cabinet and will not re-expose your components to humidity once the bake cycle is complete. Yes. 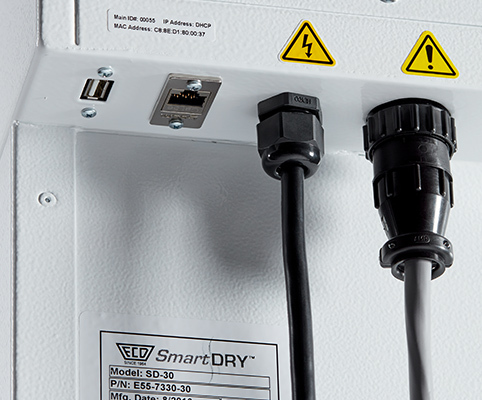 Integrated network capability is a standard feature on all SmartDRY™ models. Can I view multiple SmartDRY™ data from the network user interface? Yes. You can view multiple units’ data over the SmartDRY™ Network User Interface for monitoring without leaving your desk. 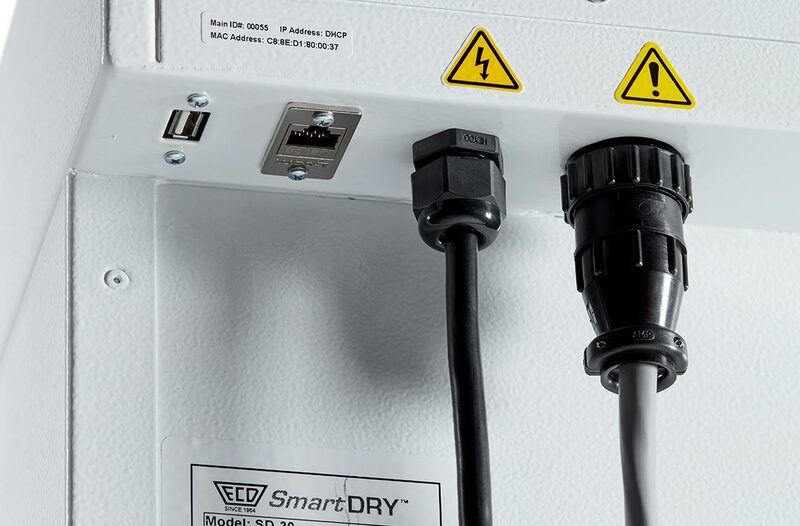 What is required for SmartDRY™ Set-up? Park into place, lock wheels and plug into an outlet! Does SmartDRY™ require any maintenance? No maintenance required. 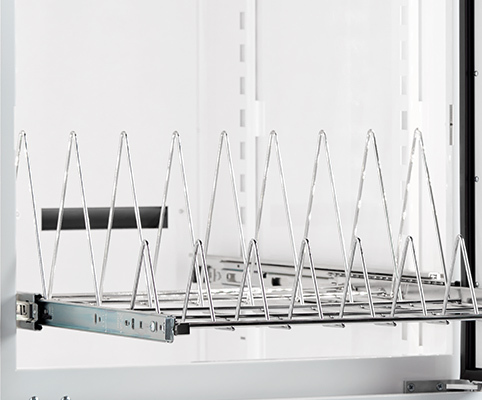 Simply adjust shelving and physically relocate with your changing production needs.